Why Choose A Travel Agent? 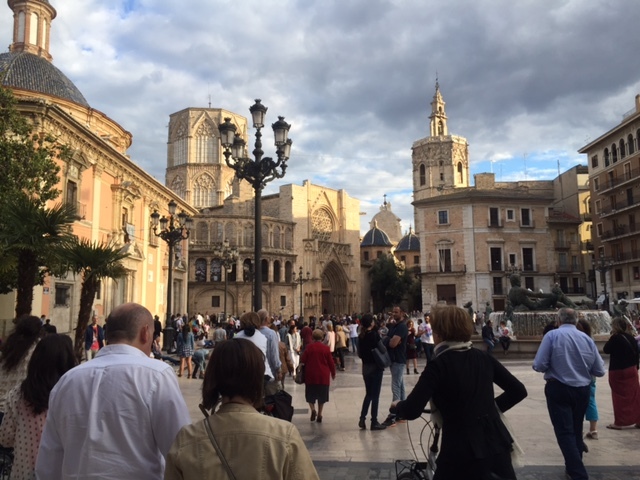 We arrived in Valencia, Spain ninety minutes late, but our reward was a beautiful day, with patchy blue skies, and temperatures in the seventies. Why Valencia? My brother and his family are spending a year there, so this detour on our trip was to visit them. My wife and son also flew in to meet us for this portion of the journey. Valencia is the third largest city in Spain, after Madrid and Barcelona, with a metro population of more than a million and a half residents. It is located on the coast, three hours south from Barcelona, and two hours west of the Spanish capital. 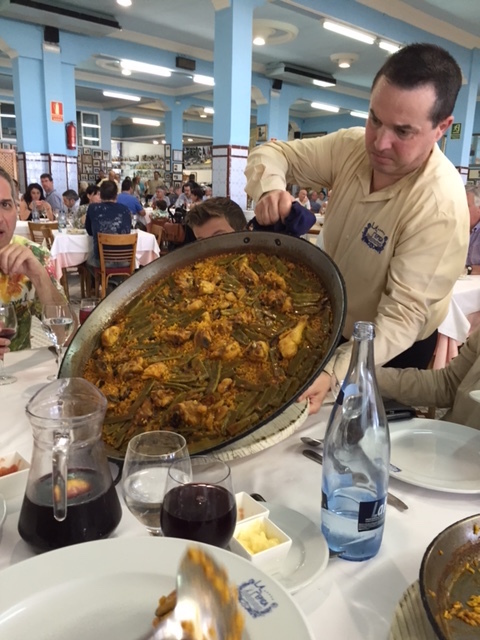 The area is a popular tourist destination, and is the origin of paella, a a simmered rice dish with seafood or meat (chicken and rabbit),cooked in a large steel pan. Valencia is also the birthplace of the cold xufa beverage known as orxata, popular in many parts of the world including the US and Latin America. The area near the airport is filled with small commercial warehouse buildings. They also serve as storefronts, and the names are in Spanish and Chinese, which seemed rather unusual for this part of the world. My brother explained that a lot of inexpensive goods from the Orient come through the shipping port (the largest on the Western Mediterranean) and are sold cheaply here, much to the chagrin of local retailers. However, for those who can’t afford luxury goods, it’s a bargain bonanza. Once beyond the airport, the city and surrounding area looks like any other European city. Sections of older crowded cityscape give way to more open, rural space, newer construction, mixed with farmland. In addition to the oranges this area is famous for, they grow figs, persimmon, pumpkin, artichoke, cauliflower, and cabbage. Small farms can be located right next to residential housing. We witnessed this first hand on a twenty minute walk around the neighborhood. It was the first time I had ever seen artichoke in its native state. That evening we dined on even more traditional Moroccan food than we enjoyed in Paris, including humus, babaganoush, tabouli, and couscous. The total bill for six people was 110€. Restaurante Balansiya, Paseo de las Facultades, 3, in the university district. www.balansiya.com. Many of the places we dined at are were my brother’s favorite eateries, so we knew we were in good hands. After sumptuous home cooked breakfast, which included scrambled eggs and spinach, sheep cheese, and scones, the ladies went off to do some shopping. As sexist as it may sound, the guys were not invited along. No problem. It was a beautiful day and we sat outside in the yard, and enjoyed some nice down time. That proved therapeutic, and was a good rest in advance of the afternoon activities. We never had lunch, and instead went into downtown Valencia. There we spent time wandering around the main square, saw the cathedral, which dates back to the thirteenth century. There was a flea market taking place with vendors selling all kinds of tchotchkes and souvenirs. While downtown, we feasted on some delicious gelato, cheese, and local beer, in that order. They haven’t really discovered craft beer to any extent, here, and what passes for good beer is an amber ale that was 5.4 % ABV (alcohol by volume.) Then we headed for Valencia Bikes to rent some two wheelers and explore the city some more. Carrer de la Tapinería, 14 valenciabikes.com. The rental price was 5 euros per hour. We meandered through the city center, dodging pedestrians and steered out bikes to the pathways along the Turia garden. This area was created by an engineering project to divert the river Turia. This important waterway had always been prone to floods, and in 1957 the flood was particularly bad. A number of lives were lost, and much of the city was devastated. Valencia decided to divert the course of the river. Out of the fertile soil of the riverbed sprung a lush garden. The resulting echo park created by the project resulted in a nine kilometer park with picnic areas, child friendly playgrounds, adult playgrounds with outdoor exercise ellipticals, and other “fitness” things for big kids. Also there are soccer pitches, and open spaces where an festival and concerts where taking place. On this particular day there were a number of booths that appeared to be educational and public health related. 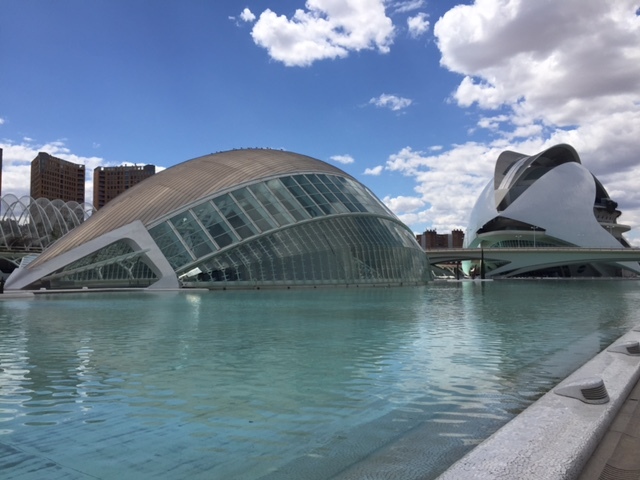 The highlight of the park was the ultra modern buildings housing the science museum, oceanographic institute, IMAX theater, opera house designed by world famous architect, and Valencia native Santiago Calatrava. We rode our bikes all the way to the waterfront and beach, a round trip of about fifteen km. 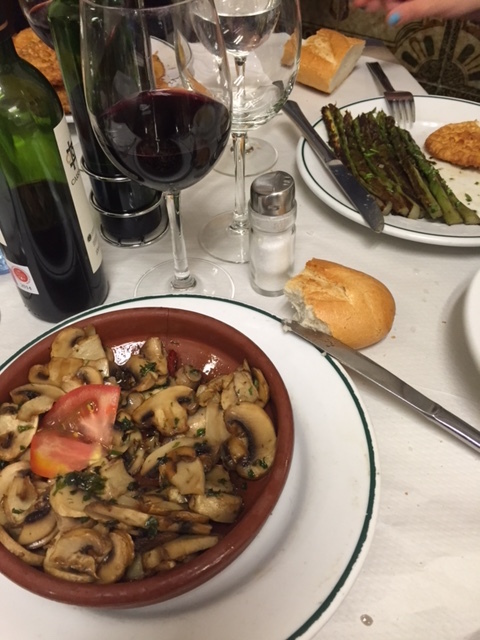 At night we returned to downtown Valencia for dinner. Old town Valencia was crowded, but not over populated with people at the many restaurants, all of which had outdoor, as well as indoor seating. People were eating, walking to and from the area, or just milling about. We ate delicious Italian food at Lambrusquería. They apparently were doing quite well, as they have taken over several of the adjacent store fronts, in addition to their original locale at 31 Conde Altea. lambrusqueria.com. They featured very tasty pasta dishes, and mine was a four cheese fiesta of flavor. Dinner for eight, with wine and dessert totaled 143€, including tax and tip. That’s barely twenty euros a person for an exquisite Italian dinner. In order to go back and retrieve the car, which had hike several blocks. The sheer volume of cars parked along the narrow streets required us to find one of the local garages. Four of us made a side detour. My brother took us to Doce, a bar, which boasts a Guinness world record 429 different varieties of gin. The gang ordered two gin and tonics, one with nutmeg, and one with some Peruvian tonic water. I opted for some Macallan Amber single malt scotch. Even as we exited Doce well past midnight, there were still lots of people out and about. The grown ups left the kids sleeping and went to a local eatery for breakfast of scrambled eggs and mushrooms. We also enjoyed a local traditional egg and potato frittata, as well as the very strong Spanish coffee. The agenda for this vacation trip seemed to be one meal after the next, so after a brief respite, and time to pack up our our stuff, we headed en masse once again to the beachfront, with its restaurant row. My brother chose one of his favorite places, La Pepica, known for its traditional Spanish paella, served in large two handed pans, in which the ingredients are cooked, then baked. There was barely enough time to stroll down their version of a boardwalk before driving off to the train station, where we took the high speed train to Madrid, Spain’s capital city. The nearly two-hour journey took us past rolling hills, and semi-arid farmland. The Hotel Villa Real was a short cab ride from the station, located within walking distance of the museums, as well as the Plaza Mayor, one of the city’s main squares. We walked down streets filled with tourists, lots of tourists, enjoying food, shopping, and drinking at the enormous number of shops and eateries along the way. The area was teeming with people. There was a rally in the Puerta de Sol (another popular square) commemorating the fifth anniversary of the Arab Spring, while a concert was being staged at the Plaza Mayor. There were plenty of police on hand to ensure nothing got out of hand. Fortunately, all was civil, and no one had to interfere. We located the San Miguel market, a very modern, veritable food court on steroids. It was comprised of stalls selling everything from tapas, seafood and meats, to vine, cheese, beer, champagne, and fruit smoothies. We topped off the evening with a stop at Chocolateria San Gines, chocolateriasangines.com which dates back to 1894 for some churros, fried dough, which unlike Mexican version lacks cinnamon sugar. Instead, one gets a cup of hot chocolate, which is a drinkable rich chocolate, that looks like a cup of hot fudge, for dipping the churros. The goal of this day was to see at least two of Madrid’s best museums. It was was a beautiful, cloudless day, a crisp cool morning with azure skies, as we headed for the Reina Sofia, with a stop for breakfast at an outdoor cafe. We ordered, scrambled eggs, a Spanish omelette, which is similar to a potato frittata, fruit and cheese. All that along with drinks for four came out to less than forty euros. Next, we located the aforementioned modern art museum, only to find that it was closed for the Feast of San Isidro holiday. Even worse news, the Sofia would be closed the following day, it’s regular Tuesday closure. That meant no chance to see it. The only bright spot was that tourist booth next to the museum told us that the Thyssen-Bornemisza Museum would be free on Mondays from noon to four, so we killed a little time and headed there instead. In addition to a very impressive collection of art that dates back to the thirteenth century, this museum houses 1600 paintings as part of the most incredible personal collections I have ever seen. The acquisition of much of the artwork was started in the 1920s as a private collection by Heinrich, Baron Thyssen-Bornemisza de Kászon. He purchased much of it from rich American collectors struggling during the Great Depression. 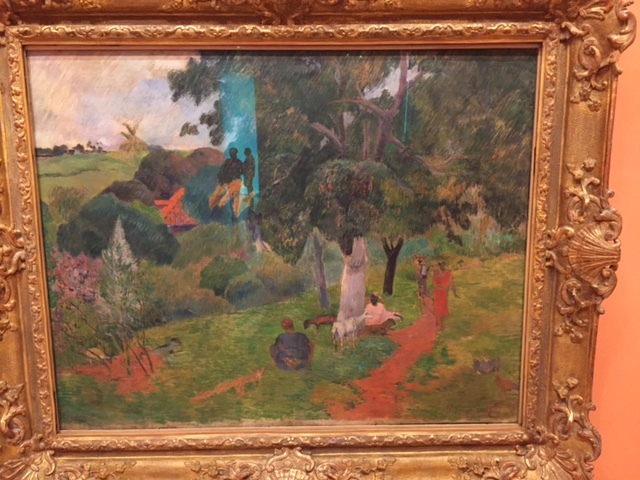 His son Hans furthered this treasure trove with more artwork from family, and new acquisitions. The younger baron’s wife Carmen was instrumental in persuading the Baron to relocate the majority of his collection to Spain, where the local government had a building available next to the Prado. The Thyssen-Bornemisza Museum officially opened in 1992, showing 715 works of art. A year later, the Spanish Government bought 775 more artwork to augment the collection, paintings from the mid-1800’s onward including works by Monet, Renoir, Boudin, and other impressionists and well as important works from the early twentieth centuries. 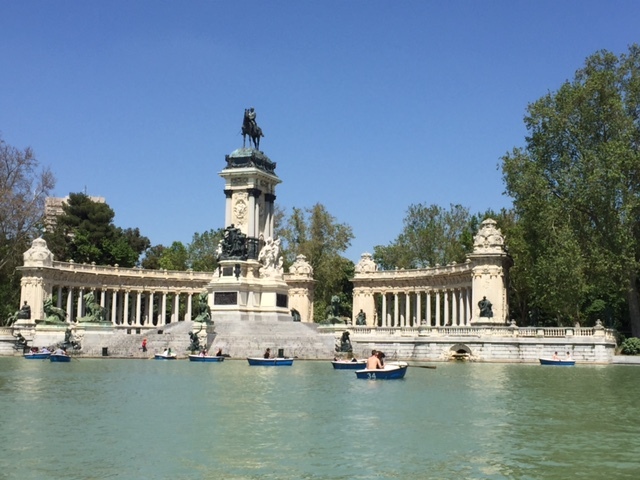 It was such a gorgeous day that we eschewed the Prado, and instead opted to go to nearby Parque de Retiro, Madrid’s equivalent of Central Park. 350 acres filled with walkways, sculptures, and several cafes, where we had lunch al fresco, adjoining a small lake that features rowboats for rent. It cost eight euros and we rowed around for about thirty of our allotted forty-five minutes. Then we engaged in the family sport of shopping, dividing our time between the small shops along the Paseo del Isabel, and a large department store that carried both European and American brands. We were able to take advantage of a tax rebate program, and with the help of our salesperson, one of my 30€ shirts ended up costing two euros after rebates and discounts. For dinner, we set out to locate a popular, but less touristy area about a fifteen to twenty minute walk from the hotel. It was a mix of traditional Spanish, Indian, pizza and other options, and we found and Asian/Spanish mix that promised us a tasty wok cooked chicken dish. They delivered, and also talked us into a vegetarian entree with fedeos, an angel hair pasta. Our mission after that mini-feast, was to find some gelato for desert. We first tried the mercado San Miguel, where we dined Sunday, but they had a small selection of branded flavored, which would have been like going to a chain ice cream shop at home. Two other stores had the exact same brands, so we took a pass as well. Finally we located a shop with homemade gelato, a mere three blocks from our hotel. During our search we wandered down a very uncrowded side street, not far from the hotel where we spied a very local, bar with dozens of dusty liquor bottles on the shelves. 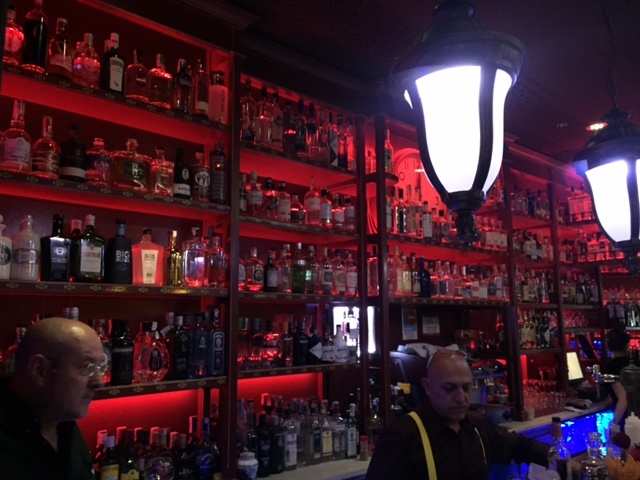 My son and I returned there after delivering the the ladies to the hotel, and discovered that it was a sherry and port bar, serving glasses and bottles right from several casks behind the bar. The old bottles were a collection of sherries from around the world, which reminded me of the gin bar in Valencia. However, this place was much more low key, filled with mostly local patrons. We had four glasses of the different libations, plus a cheese plate, and the whole thing cost less than twelve euros. The bartender kept everyone’s tab in chalk on the old wooden bar itself. We made plans to take the rest of the gang back there the following night. Instead of searching for an eatery, we simply had breakfast at the hotel, where they had the typical European buffet of cereals, bread, fruit, meats, as well as items cooked to order including omelettes and pancakes. At some point we had to do a little business, so Jennifer and I met with a representative of the hotel and got an official tour of the property and its sister hotel, the Urban, just around the corner from the VillaReal. Whereas the VillaReal is a more traditional hotel, the Urban, constructed ten years ago is more modern and upscale, with a indoor courtyard, a terrace with excellent views of the surrounding area, and a small museum containing items from the personal collection of the hotel owner, which included wood carvings from Paupa New Guinea dating back to the late 1800’s. The VillaReal on the other hand, has large Roman era mosaics from the local area. We gathered the troops and headed out for a day of exploring the city of Madrid. Like most large cities, they also have several hop on-hop off buses. 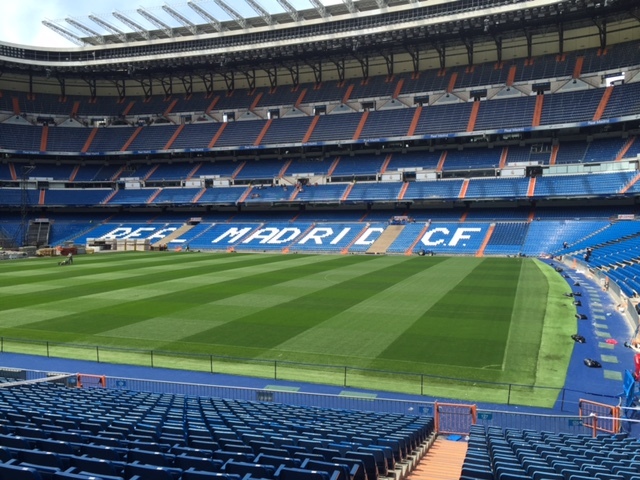 We caught a Madrid City Bus and rode the route 2 north to the Bernabeau Stadium, the home of Real Madrid, one of the premier sports clubs in the world. For just 19€ we got a self guided tour that included a view from the upper deck of this 85,000 seat stadium, a visit to the club’s history museum, with its gigantic trophy case. Or perhaps I should have said trophy cases. Real is one of the most decorated clubs as well, have won pretty much every league, country, and European title during its illustrious and rich history. 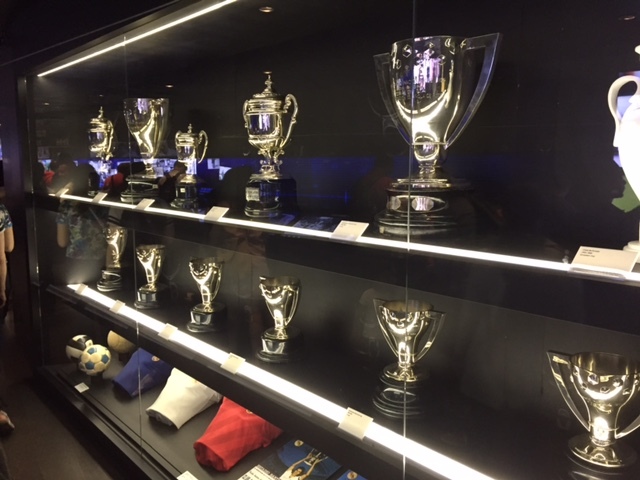 The team museum had not one, but five, room length display cases to hold all the hardware the club has won during its storied history. There were other exhibits including an opportunity to pose with the UEFA champions league trophy garnered in 2014. A number of my colleagues have had their picture snapped with Stanley Cup, but not many have had a chance to hold this equally renowned piece of silver. The tour also included a stop in the owner’s boxes and VIP seating area, as well the the locker rooms and player benches on the pitch, plus the obligatory finish at the team store. We rode the bus some more, enjoying great views of the local architecture. Whereas in Paris, even newer buildings are constructed in the City of Light’s French colonial style, edifices in Madrid run the gamut from Spanish colonial, to thoroughly modern, coexisting, sometimes, side by side. We stopped for some some lunch at Vait, a chain of high end pastry and gourmet , where our lunch, which included goat cheese lasagna and grilled swordfish. After buying some cookies and pastries for the road, we continued our sightseeing, with stops at the Egyptian temple, and the presidential palace. It was closed for some official function, because the king was in residence. It was a beautiful day, and when we out back to the hotel, we sat outside and enjoyed our complimentary glass of champagne, which we augmented with a (paid) cheese plate. After some rest, and packing, it was off to the next meal. This time we consulted Yelp for guidance in locating an authentic Spanish restaurant. We hit the jackpot with one of the top meals of the trip. It directed us to La Semerosa, calle Amor De Dios 12, where for sixteen euros each, we had a three course dinner. The appetizers were terrific. Grilled asparagus, mushrooms, and eggplant fritters. Dinner included steak and veal, and sumptuous desserts featuring a super moist cheesecake, sponge cake, and flan. Flan, a traditional custard pudding topped with caramel is one of my favorite desserts, along with tiramisu. If it’s on the menu, I’m getting it. This version of flan was served with whip cream on the side, and was one of the best I’ve had in a long time. Water was complimentary, and a tasty half bottle of wine was a mere 6.5€. We mangled to stop by the sherry bar again, and tried some more libations. We even bought a bottle of Oloroso, which means “aromatic” in Spanish, to bring home. Five drinks and a bottle to go totaled less than 25 euros. A great way to end our last night in Spain. Just as the hotel had predicted, the taxi ride to the Madrid airport took 40 minutes. The fare was a fixed price of thirty euros. The driver and I engaged in a lively conversation about gas prices and energy efficient cars. One sees very few gas guzzlers on the road in Europe. They consider an SUV a very large car. Most people drive compact cars, and drive far less than Americans do. The driver noted that he only puts about 7500 kilometers a year on his personal vehicle, which was typical. At a little over a euro per liter, Spaniards were paying about four dollars a gallon for their gas. Diesel is very popular there. By comparison, Parisians were shelling out about 10-15% more. Madrid’s airport is very modern and we had to take a train our to our gates, similar to Atlanta’s giant airport. Between some slight confusion at check in with our seat assignments, some duty free shopping, and a pause for some breakfast, two hours passed rather quickly. We arrived at the gate at boarding time, which was another mass gathering. Our priority boarding put us at the front of the queue, only to have to wait in the jetway for an additional ten minutes. After these experiences, I don’t think I’ll ever complain about boarding procedures in the US. It was an uneventful nine hour flight home. Spent the afternoon walking around the old city and Las Ramblas. Some nice stores and liked the little artists stalls just a block away from Las Ramblas. Toured the W and had drinks up on the top floor. Fabulous views of the city at night up there. Dinner at their casual restaurant. The food was good, but nothing special. The rooms at the W were large and comfortable. They all have window benches overlooking the water. I loved sitting on the window bench and looking out at the sea. The bed was comfortable, but the bathroom was only okay. The sink was large and left no room for your stuff, but it was outside in the room. The shower was large, but the towel rack was at the back, so you had to go into the wet shower to hang your towels after you were dry. The pool area was fabulous, large with lots of places to sit out. Would be great for a family. There is a beach right down below where they can provide chairs to sit on. The lobby was large with lots of places to sit down. Also if someone likes to go for a jog or a walk, it was nice to stroll along the waterfront. The location was away from the shopping and sightseeing, but the cab ride was cheap. About 5 euros tops. We had a half day tour of Barcelona. We spent quite a bit of time at the Sagradia Familia. Both inside and outside. It was fascinating. We also went up to the top of the hill where he history museum is, former sight of the world’s fair and Olympics. Great view. We then walked Las Ramblas and the old quarter. We even went in the old market. Didn’t get a chance to eat anything, but you can. We did a lot in half a day. Went on our own to one of the Guadi apartments. The roof top was the coolest part. Lunch was at a fancy wine bar called Mon Vinic. Great food and wonderful wines for anyone who likes local food with a new twists. Dinner at Le Meridien. The Lobby was strange, we bad music. The standard rooms were on the smaller side, but the rooms with the terraces were great. Wonderful location. Dinner there was fine. Left Barcelona via train for Madrid. The train was comfortable. The station was okay to navigate, but you have to be able to move your luggage off and on the train by your selves. They served a meal in first class, but it was pretty bad. Arrived at the Palace Madrid. It is so close to the train station, you could almost walk it. The hotel is lovely. The reception area is beautiful with murals. The sittings areas are stately. The room was large and comfortable. The bathroom had double sinks, shower in tub and toilet a bit set back. Lots of closet space and a nice chair to sit in. Comfortable bed to sleep in. You have to ask permission to open your door out on your French balcony for insurance purposes. We did a night walking tour of old Madrid. It was fun to see the squares and monuments all lit up. You have to have on good walking shoes to do this. The streets were very lively at night. It was fun to see all the locals out. Had dinner at a nice at a local restaurant. It had a lot of atmosphere and the food was tasty. Very traditional food. 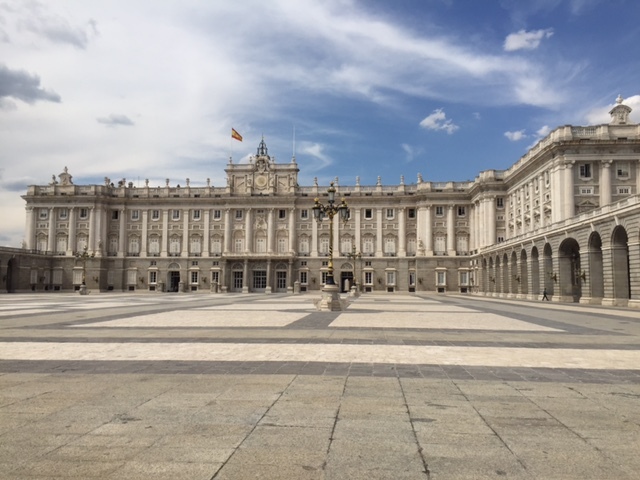 Whole day tour of the palace and the Prado. As it was Sunday we did stop in the flea market, which was huge and spread out. It was fun to see. A variety of old and new things. The Palace was wonderful. Worth going to see. The Prado was fine a must for a short time. Lunch stop at a local restaurant with Made for Spain people. The food was good, but you have to like local foods. Excellent calamari. Dinner at the hotel was good. Had drinks in the bar before hand. It was good, but expensive. Drive up to Rioja with a stop in Lerma. Once we got out of Madrid, it seemed an easy drive on the highway. Roads were well marked and they didn’t seem to drive too fast. Stopped in Lerma to see the Parador. It was a cool old castle. Very scenic in a small town with narrow streets and a big square. It would be a nice stop for lunch. The food was a bit odd, but I think it was the menu they choose for us. Arrived at the Marques des Riscal. It is truly unique and fabulous. The contrast with the modern building, the vineyards with the beautiful leaves changing colors and the old medieval town. Toured the hotel. It has a lot of facilities for a small hotel. The spa looked lovely with a big indoor pool, hot tub, steam room and a lot of treatment rooms. There are two major restaurants, a nice library to hang out in and a lot of outdoor space to sit out in when the weather is nice. The rooms in the original building are odd shaped and the bathrooms were more cramped. The rooms in the spa building were great. Large and comfortable. Lots of places to sit and all sorts of light controls. The bed was kind of hard. The bathroom was great. Big double sink, separate large tub, walk in shower, separate toilet and a big closet. Again gorgeous views. It was a like a picture postcard. We had dinner in the more casual restaurant The dinner was good. We had a nice modern twist on local foods. Tour of part of the Rioja area. We went to the monestary that was so interesting. The place they found the first written Spanish. If you don’t go with a guide, they only speak Spanish. Our guide translated what they said. We then went to see the Cathedral… This pilgrems still come through their way to Santiogo des campestello. We say the dorms that house them. We had lunch at another parador. Not as interesting as Lerma. We did an hour tour of the winery at the hotel. It was very interesting. We got right up close to the machines, bottles and old wine cellar. Dinner tonight in the fancy restaurant. We had the memory meal, that was fabulous. Left from Bilbao for flight to Lisbon. It took about 75 minutes in the rain. The flight was okay, but on a smaller plane. Arrived into Lisbon and taken to the Sheraton. It is in a fabulous location with a recent renovation. For a mid-range property this is very good. The rooms looked comfy, but not too big. The club level lounge was nice with lots of amenties. It has a nice outdoor pool and sun deck. Good work out facilities and a spa. WE had lunch at the top in their restaurant. It was good, with great desserts. The drive to Evora was just over an hour. Again it seemed easy, if someone wanted to drive themselves. The hotel has a fabulous old church that is still used once a month for services. The rooms are a bit spread out. They all have terraces or balconies. The standard rooms have traditional décor it was okay in sive.Then there are designer suites which are a bit larger with strange modern paintings. There are some unique suites in the old building for a special occasion. The spa has a nice indoor pool, that was kind of cold. The spa treatments only got a mixed review. The bathrooms are okay. The sink area was kind of short on space. There is a separate tub and shower. You have to be okay walking far to your room as it is spread out. There is an outdoor pool, playground and tennis courts. Again the bed was kind of hard. We had a wine tasting in their cellar, where every night they invite guests for a wine tasting. Dinner was good at their restaurant. Wine tour of a local winery. Very similar tour to the one in Rioja. They also had olive oil that was fabulous and their wines were good as well. We had a cooking lesson in the bar at the hotel. It was fun to learn knife skills with the chef. We ate what we cooked. It was good, but fishy. Afternoon walking tour of Evora. We saw a church made out of bones. Very creepy. They also have a cathedral and old roman ruins of a temple. The town was okay. It had some nice shops and cute cafes to sit out in. We had dinner with local specialties in an old horse carriage house that was made to look kind of like a farm house. After dinner the people that run it sang old Portugess songs. It was special. Stayed at the Four Seasons. Close to where the Sheraton is. Great location by a park and one of the main statues. The lobby and lounge area were fabulous. The best chocolate cookies with the coffee. The rooms were large and comfortable. The bathroom again with double sink, separate shower, tub and even toilet. Lots of room and balconies overlooking the park that you can sit out on. Nice spa and workout room, with great views of the city. Did not eat at the restaurant. We did our own self guided tour, with advice from Henri at the FS. 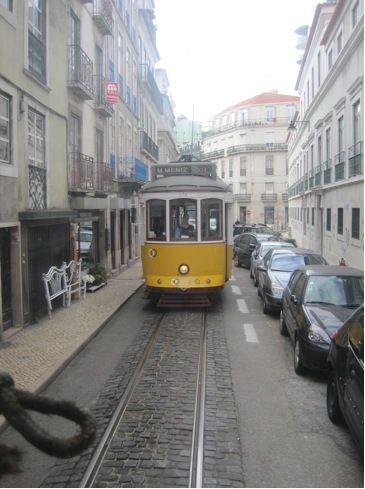 We took tram 28, with the locals and other tourists. What an experience going up and down the hills in the old tram. We stopped in the Chiad area and at a famous café and shopped at the famous glove shop. We continued up the hill for more fabulous views of the city. Made the three block walk almost straight up to the old castle grounds. It was great to walk around the old castle and up on the old walls. You have to be good at stairs to walk up on the walls. Dinner at a local restaurant not far from where we had lunch. Lisbon is very hilly, like San Francisco. The streets are very narrow in the old parts. Head home. On a Saturday morning with no traffic, we were about 15 minutes from the airport. Very convenient.